I’m quite convinced that at least 80% of Logic users are using Space Designer as a preset-only plugin, just because of the sheer amount of the presets. Don’t get me wrong, there’s nothing bad with that, it’s just so overwhelmingly cool tool to be overlooked. 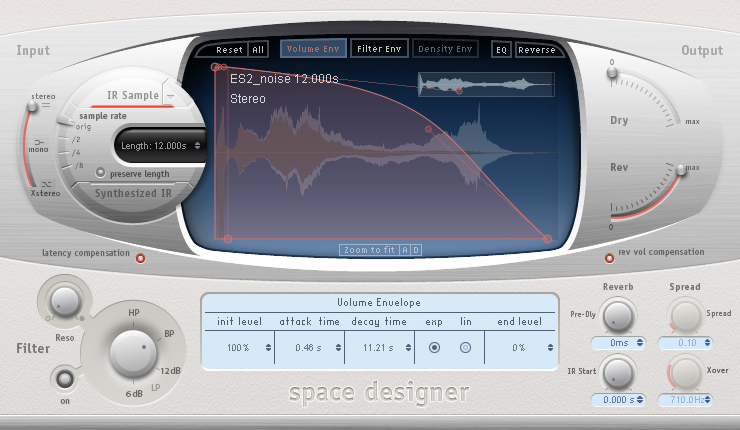 It’s quite ok to do Impulse Responses with a specific Apple-provided tool placed in the Utilities folder on your hard drive, but Space Designer can take just about any sample and use that sample to process your tracks. For instance, we could use this ES-2 filtered and flangered stereo noise: es2_noise and turn ep_mello_dry into something like ep_mello_fx , even though the difference is quite subtle at modest listening levels, try putting your headphones on. Nice, isn’t it? Only one instance of Space Designer, and even my old 2 x 2.7 GHz G5 didn’t show much load. If you’re daring enough and use resonance or flangers carelessly, you might want to insert a compressor before the Space Designer, to lower the resulting frequency peaks a bit. And the fun doesn’t have to end here. Put the noise file on an audio track and cut and slice it to your heart’s content and turn it into something like es2_gated_noise. Load that as an IR and the previous ep_mello_dry turns into a pulsing ep_mello_fx_gated. Now that is something I might need. A reverb that’s not a reverb nor it’s a delay. Link: ES2_noise.zip (load it into your Space Designer as an IR).